Hunting season is underway in Texas, save on deer corn and deer minerals with Argyle Feed Store’s Deer Corn hunting specials. New – we now offer Texas Hunting & Fishing licenses. Skip the long lines and shop local at Argyle Feed. Deer Corn 5.99 – Argyle Feed & Hardware carries 50 lb. bags of RealTree Deer Corn for only $6.99 each. Deer corn is an overall favorite for whitetail deer, and it is a favorite among most hunters as well because of its low cost and high effectiveness. Whether used in a feeder, or simply put in a pile on a high traffic area, deer corn can be a great way to attract deer. Come on by our store today and pick up your RealTree Deer Corn. 10% off Deer Minerals – AntlerMax® Mineral Technology provides a power-packed nutritional package with proprietary levels and ratios of essential vitamins and minerals to help promote optimal antler growth, density and strength, reproductive performance and fawn health. Don’t forget about deer feeders & blinds! Argyle Feed & Hardware offers high-quality deer hunting products! 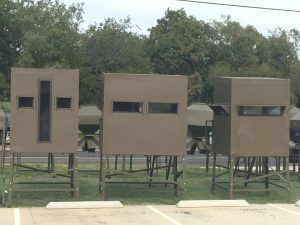 TWS Deer Blinds and Broadcast Deer Feeders are professionally engineered and designed to provide the ultimate in safety, comfort, and structural integrity. Simply put, they are built to last and are 100% maintenance free! Hunting season isn’t complete without a Yeti Cooler. Come see our selection of Yeti Coolers, Hoppers & Rambler Series cups. Want a Yeti cap or t-shirt, we have them. Argyle Feed is your Yeti Headquarters for the holiday season. Skip the big box stores and shop local, shop Argyle Feed Store. This entry was posted on Sunday, October 30th, 2016 at 3:13 pm	and is filed under News & Updates. You can follow any responses to this entry through the RSS 2.0 feed. Both comments and pings are currently closed.